The darkest, most churning US death metal is no longer produced in the US, but in la bella Italia. If nothing else in the last couple of years Milan/Lombardy-based Ekpyrosis has vowed to carry on the sound that Incantation and Immolation have since abandoned. Not surprising considering it is the heart of Roman Catholicism and the religious disease should be fought tooth and nail. “Asphyxiating Devotion” is the quartet’s debut for underground specialist label Memento Mori and the follow-up to the well-received “Witness His Death” EP from 2015. More inspired by various eras of Incantation than by Dutch death/doom metal stalwarts Asphyx, “Asphyxiating Devotion” is thoroughly and utterly devoted to its genre, but none of it feels insincere or fabricated. “Asphyxiating Devotion” sees Ekpyrosis coming into its own and marks the beginning of the band’s Diabolical Conquest. For the most part “Asphyxiating Devotion” is made up of entirely new material. It is custodian to another re-recording of ‘Morticians Of God’, a cut dating back to the “Black Aspid Of Doom” rehearsal tape from 2015. Only ‘Morticians of God’ and ‘Depths Of Tribulation’ differ slightly from the rest of the album in that both lean more towards a Stockholm death metal sound. ‘Unearthly Blindness’ breaks stylistically with the rest of the album as it is closer to “Luck Of the Corpse” era Deceased than any era of New York genre pillar Incantation. All things considered it are minor tonal hiccups as the remainder of the record is consistent within the context of its chosen influences. The inspirations and influences behind Ekpyrosis as a band are fairly self-evident and they at no point are they reinventing the wheel or breathing life into a stale, artistically vacuous, self-referential genre. Bereft of any pretense and prefixes Ekpyrosis has always been a band to pride itself in being able to do more with less. This is a death metal record, pure and simple. Ekpyrosis embodies pure death metal and in sheer decrepit atmosphere and all-encompassing gloominess they are only matched by late 90s (and now long defunct) Canadian studio act Darkness Eternal and Morpheus Descends. Compared to the preceding EP “Asphyxiating Devotion” leans more towards different eras of New York/Pennsylvania death metal monument Incantation than to the early Swedish scene. 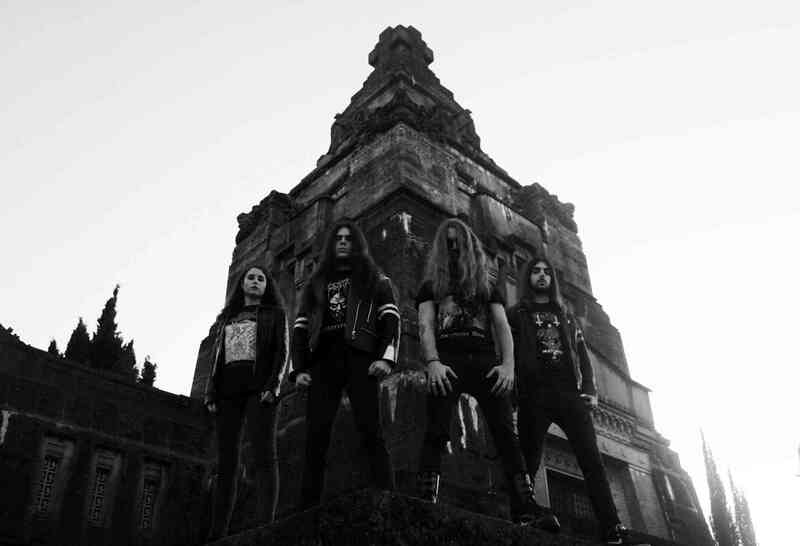 “Asphyxiating Devotion” combines the dense structures of “Onward to Golgotha” with the more straightforward riffing of post-“Blasphemy” Incantation. The vocals of guitar tandem Marco Teodoro and Nicolò Brambilla more often than not resemble Mike Saez and John McEntee in the more shriekier passages. Marco Cazzaniga (bass guitar) is a nonentity even though he provides serviceable enough low end tones. Cazzaniga (who has since defected) dutifully doubles the guitars but isn’t given much space to do anything interesting. Hopefully Ekpyrosis will see it fit to allow their bassist a greater presence in future output to truly show the world what he is capable of. On the “Witness His Death” EP the drumming of Ilaria Casiraghi tended to sound similar to Joakim Sterner (Necrophobic) and Anders Schultz (Unleashed) but on its Memento Mori recording debut she resembles long-serving Incantation skinsman Kyle Severn and occassionally Deceased drummer King Fowley, both stylistically and in overall delivery, more often. “Asphyxiating Devotion” sounds like a 1990s USDM record and making it all the more impressive is that Ekpyrosis is a just a bunch of guys and a girl hailing from Italy, once home to a blooming exploitation cinema industry and some of the most beautiful starlets in all of continental Europe. These days Italy is rather infamous for its mechanical and, frankly, sterile breed of faster-than-thou death metal. Just like the Germans of Necrophagist, Hour Of Penance has a lot to answer for. Ekpyrosis is the antithesis of the stereotypical Italian sound and their breaking with tradition is what makes their music so engrossing. The handdrawn artwork by César Valladares bathes in monochrome and its precisely the sort of thing you’d expect a band like Ekpyrosis to use in terms of visuals. Would “Asphyxiating Devotion” have benefitted from a canvas by Miran Kim and Wes Benscoter? Probably. Is it necessary for the experience? Not in the slightest, but it would have helped further cement the bonds to early, prime era Incantation and Deceased. As it currently stands Ekpyrosis is one of the best death metal exports from Italy one is likely to find.